The next morning I sit at the meeting table with all the logistics officers from the old Italian crew: a few Italians, a Polish guy, a Brit, a Dane and myself, all chaired by a Spanish colonel. The new British officers that have already been flown in are sitting like classical back benchers in chairs behind the normal crew at the meeting table. They doodle a little, avoid eye contact and give the general impression that they hardly listen to what is said at the table. Is it uninterested arrogance or something different? I give them the benefit of the doubt. I can remember that it took me some time to get used to the new situation, and especially to the Italian-English that is spoken here. It is a very simplified way of talking, with few difficult words and heavy Italian (or other) accents. I did listen, but the first few days I hardly understood a word. At the end of the meeting, Carlo lists the any-other-business. ‘Do you have problems?’ he asks me as Chief Air Transport. A shrieking, roaring sound rises from behind us, as if a wall of sound comes our way. Startled, we turn around and see the British officers doubled over in their chairs, one hand on their bellies, the other hand holding each other. One of them slips off the chair. I feel a blush of shame when I realise what I have said, and am infected by the laughter. All the others are laughing too, except the Italians, who look surprised at each other. ‘If one of the Italians had said it, it would not have been a problem, but you,’ one of the Brits snickers. It takes a few minutes before we are able to continue the meeting. I don’t know what to say to him. British humour is wasted on some people. 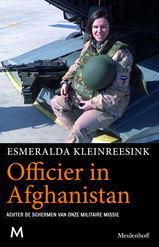 You have read a translated excerpt from ‘Officier in Afghanistan’ by Esmeralda Kleinreesink. Interested in acquiring the foreign rights? Please contact Dutch publisher Meulenhoff.